Prvi Partizan is no stranger to making military-style ammunition -- as they are owned predominantly by the government of Serbia, they’re the sole supplier of ammo to the Balkan country’s military and law enforcement agencies. 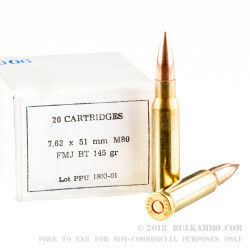 This high quality 7.62x51mm is certain to satisfy all your shooting needs. When’s the last time you heard a Serbian veteran complain about his ammo? 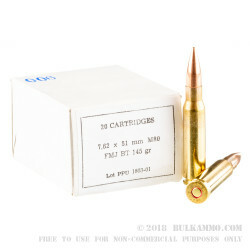 This cartridge sports a 145 grain projectile. 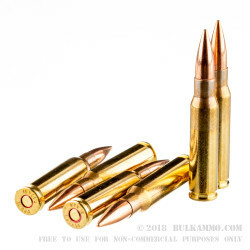 The bullet’s full metal jacket equates to jam-free feeding in your semi-automatic, and will keep its bore from becoming dirtied up with lead residue. This is a boat tail bullet as well, and its tapered base will increase its ballistic coefficient to give it the resistance to wind drift, velocity retention, and flat trajectory you need for superior downrange accuracy. 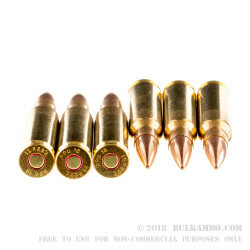 This round’s brass casing is perfect for handloading. Its Boxer primer is non-corrosive, and is protected by a useful red sealant. Order today and be prepared for the range!